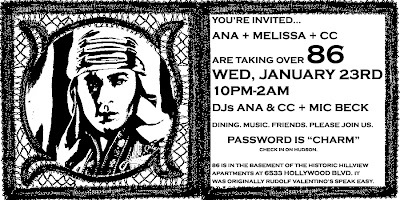 Melissa,Ana and myself are hosting a very special night at a super secret club tomorrow. The bar was once run as a speak easy by famous film legend Rudolf Valentino. It's been locked up all these years and we're opening it up to our friends to come enjoy some good times. I would really appreciate all the good friends, new friends and supporters to be there. Also, if you're going to Steve's album release party at the Roxy come by 86 after.